Celiac.com 10/16/2013 - A crust of almonds and almond meal highlight this delicious, gluten-free version of a traditional cheesecake. Heat oven to 300F. Place all nut crust ingredients in a mixing bowl and mix well. Lightly coat the bottom and sides of an 8-inch springform pan with oil. Pour the nut crust mixture into the pan. Use the bottom of a measuring cup or glass to press the crumbs down into the bottom and 1-inch up the sides of the pan. Place crust in oven and bake about 5 minutes, or until the crust is slightly browned. Remove and cool. Gradually add sugar, lemon zest, and vanilla. Add the eggs, 1 at a time, and continue to beat slowly until combined. Beat 1-2 minutes until creamy, but not over-mixed. Bake at 300 degrees F for 1 hour. The cheesecake should still jiggle, so be careful not to overcook. Remove and allow to cool in pan for 30 minutes, then place in the refrigerator, loosely covered, for at least 4 hours. Loosen the cheesecake from the sides of the pan by running a thin metal spatula around the inside rim. Release the side of the pan and set aside. To slice the cheesecake, dip a thin, non-serrated knife in hot water, make a cut, then wipe blade dry after each cut. Garnish slices with berries or a dallop of lemon curd. I haven't tried this yet - how much sour cream is supposed to be added? It is mentioned in the second paragraph but is not listed in the ingredient list. Recipe doesn't say how much sour cream to use. How do you know if creme cheese is gluten-free? We have not eaten creme cheese (or cheesecake) since my daughter got sick one day and we could not figure out what it was, the only possible suspect was the creme cheese. It was a generic brand served at her preschool. However I contacted Kraft at that time (about 2 years ago) and they could not guarantee their Philadelphia brand is gluten-free so we just gave up on creme cheese. Very sad about that. Same with Barbara, have not tried as you do NOT list sour cream in the ingredients but list it in the instructions. How much sour cream please? I have a recipe that is very similar to this one. It calls for 3 cups of sour cream. It makes a cheesecake that is not as heavy as a New York-style. (mine uses 1/4 t salt, 2 t vanilla and no lemon peel. otherwise identical) Thank you for the crust recipe. That's what brought me here! I'm a little confused. How can there be gluten in cream cheese? The only ingredients I've seen are milk, cream, cheese culture, salt and some kind of bean gum to thicken. I omitted the sour cream and lemon and had excellent results. My mom calls it my signature cheese cake. Everyone gobbles it down! This is my second time making this recipe. This time I added 2 tablespoons of sour cream, and instead of just adding the eggs directly in, I separated the yolks from whites and whipped the whites into firm peaks. The yolks went directly into the mix, while the whipped eggs whites were added at the end. I gently mixed in half of the egg whites, and then folded in the other half. I think it helped make the cheesecake just a little lighter! Measurements by volume are inconsistent depending on the method used and the recipe is incomplete. Managed to make it work after sifting through the poor layout. I have almost this exact cheesecake recipe and it calls for 1/2 cup sour cream and 2 eggs instead of the 3 listed here. I usually cut the sugar in half and no one can tell the difference. I came for the nut crust recipe and will try that this weekend. Thanks for your comment. Sour cream was mentioned by accident, and I have corrected the article to reflect that fact. However, I have used a couple of tablespoons in the past. I hope this helps. Celiac.com 11/21/2014 - This holiday twist adds pumpkin and spice to one of our most popular gluten-free cheesecake dessert recipes. It’s sure to be a big hit with cheesecake lovers, pumpkin pie lovers and, most importantly, gluten-free eaters looking for a delicious dessert. Place all nut crust ingredients in a mixing bowl and mix well. Add pumpkin, and beat slowly while adding sugar, pie spice, potato flour and vanilla. Add the eggs, one at a time, and continue to beat slowly until combined. Beat 1-2 minutes until creamy, but not over-mixed. Pour the filling into the crust-lined pan and smooth the top with a spatula. Note: I sometimes have extra filling. If so, I just use what I need and discard the rest. Remove and allow to cool in pan on a wire rack for 30 minutes, then place in the refrigerator, loosely covered, for at least 4 hours. 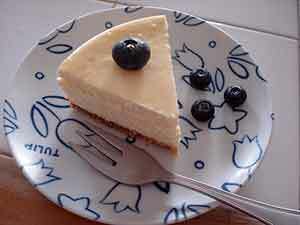 To slice the cheesecake, dip a thin, non-serrated knife in hot water, make a cut, then wipe blade dry after each cut.